The Source Report is designed to keep you abreast of developments affecting the spot market and the futures market. It’s issued daily. Subscription is free to qualified members. Reports are in PDF format. 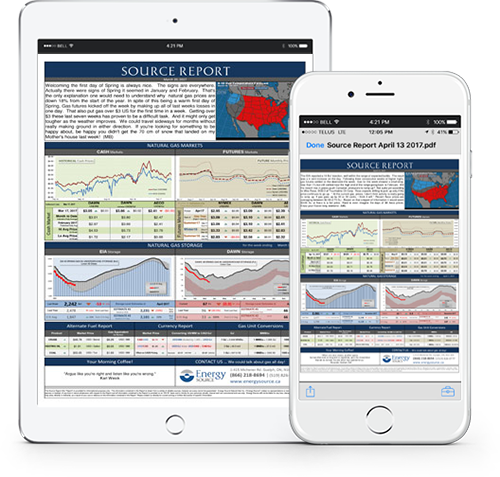 The Source Report is designed to keep you abreast of developments affecting the spot market and the futures market. It’s issued daily. Subscription is free to qualified members. We track NYMEX (including Henry Hub and NYMEX futures), AECO, and DAWN historical and current natural gas prices. We chart the NYMEX forward curve, the AECO daily vs. next month prices, and year on year EIA storage data. We also include a Canadian long range weather forecast from Environment Canada. The Source Report (the “Report”) is provided for informational purposes only. The information contained in the Report is drawn from a variety of reliable sources, however accuracy cannot be guaranteed. Energy Source Natural Gas Inc. (“Energy Source”) makes no representations or warranties, whether express or implied, of any kind or nature whatsoever with respect to the Report and all information contained in the Report is provided on an “AS IS” basis and is strictly for your personal, private, internal and non-commercial end-use only. Energy Source will not be liable for any loss, damage or injury which may arise, directly or indirectly, as a result of your use or reliance on the information contained in the Report. Please contact us directly for current pricing or further discussion of specific information.